In spite of the wintry weather, we had 30 attendees at the Northern Illinois Wine Growers (NIWG) meeting on Saturday, January 25, at Famous Fossil Vineyard and Winery in Freeport, Illinois, west of Rockford. In addition to educational events, NIWG volunteers also manage a research vineyard located at Galena Cellars Winery near Galena, Illinois. Left to right: Lynn Pease, NIWG President; Ken Rosmann, winemaker at Famous Fossil; Pam Rosmann, Famous Fossil manager; Royal Scheider, assistant winemaker, Famous Fossil and Mike White of Iowa State University. Our featured speaker on Saturday was Mike White from Iowa State University who donated his time to educate us about herbicide drift. Mike joined the ISU Extension in 1994. He has experience managing many agricultural resources and is one the Midwest’s top viticulturalists. Mike’s main topic was herbicide drift, but it was really interesting to learn about Mike’s work in Iowa and other states. He covered many topics, including getting recognized as a wine region, creating a quality certification program and how the ISU sensory panel works. 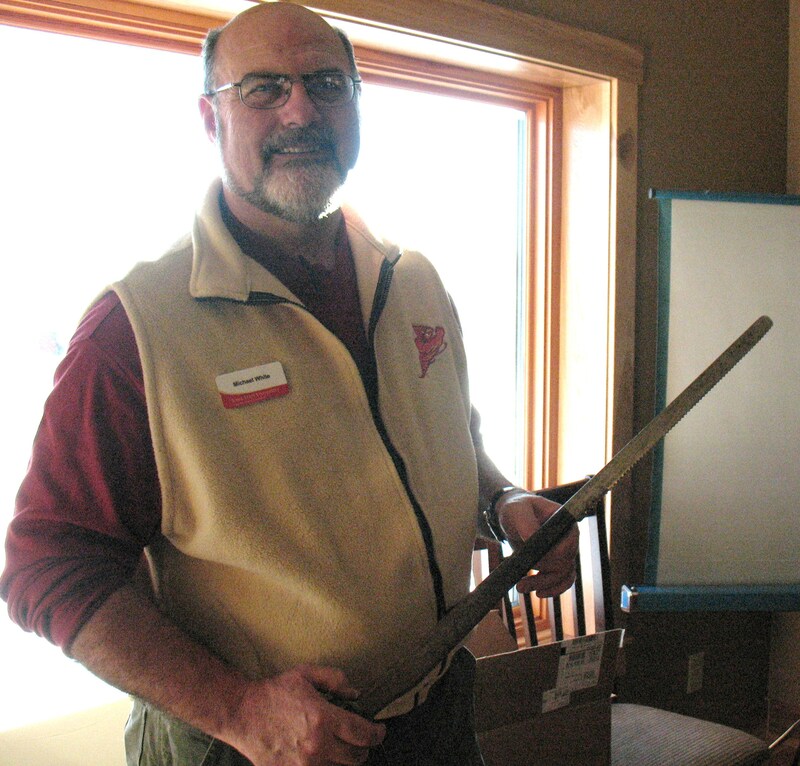 Mike with a Christmas tree hedging knife that he uses on grape vines. Regarding herbicide drift, Mike said he was cautiously optimistic about the release of new 2,4-D resistant corn and soybeans. Mike believes that Dow AgroSciences, which is based in Indianapolis, tends to be conscientious about volatilization and herbicide impact on other crops. Regardless of what type of herbicide may come into contact with grapes, Mike stressed the importance of site selection. Avoiding locations in close proximity to high maintenance areas, like golf courses and cemeteries, or where aggressive brush control may occur can save vineyards owners a lot of hardship, Mike cautioned. Look for indicator plants along the route of the drift; drift damage usually shows up along a clear line. File a drift complaint with the your state’s Department of Agriculture as soon as possible, and no longer than 30 days after the damage. It is also important to allow a neutral third-party do a residue analysis and report on the situation. Take regular photos of drift over time and document when the photos were taken. Mike suggested photographing healthy and damaged vines at the same time. To help stay organized with your photos, place a pole with an identifier next to both a healthy and a damaged vine at varying time intervals. Writing the date in bold letters on a piece of tape that can be stuck to the pole is a good way to time stamp your photos. Do not trim the drifted parts of the plants, as that can damage the plant and will remove evidence. Mike said trimming drift damage will not lessen the impact of the drift on grape clusters. Leave the crop on, as you must be able to show damage from herbicide drift. Drift Damage shows up quickly; within one to five hours on buds, leaves, tendrils and roots. Don’t settle quickly with the insurance company because damage or death may not occur until the next growing season. Most herbicide drift damage cases are settled out of court. After Mike’s session, Ken Rosmann, my husband and winery partner, talked about Famous Fossil. Attendees seemed most interested in how Famous Fossil uses native fermentation. As far as we know, we are one of only a few wineries in the Midwest using fermentation with native yeasts. To cap off a great day, the group tasted our Marquette and Fossil Rock White, a white blend of Prairie Star, Lorelei, Brianna, LaCrosse and Petite Ami. Editors note: Famous Fossil also uses many sustainable practices in their vineyard. 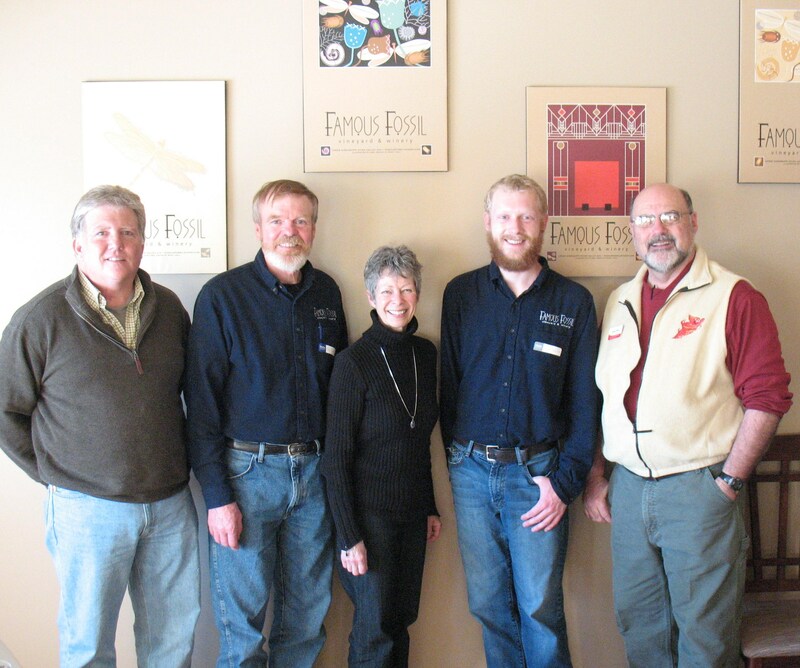 Pam Rosmann is the head of event planning and the tasting room at Famous Fossil Vineyard and Winery. That is only true if wineries are using local grapes! The sad truth is there are many wineries who are perfectly happy to ship in out-of-state grapes and pass their wine off as a local product. There is no division between vineyards and wineries that use local grapes! Vineyards make a huge financial and labor investment. They have a right to promote their product and the wineries who use their product. It should not surprise anyone that growers don’t want to promote wineries who do not use their product. Sadly some industry leaders view this as a “division”. Wineries and local growers need to work together to make sure that the vineyards that are growing are local vineyards. Consumers expect local wineries to use local grapes and surprised and appalled to find out that “local wines” do not always contain local grapes.